NATURE RESERVE - Found in international tourist guidebooks every year since 1997, Finca Cántaros in Linda Vista de San Vito is a unique property of just over 7 hectares or 17.3 acres in a cool, comfortable, tropical highlands climate. The property is currently being managed as a private nature reserve open to the public (with entrance fee) with magnificent trees, tropical gardens, 1-hectare/2.5-acre lake/wetland (Laguna Zoncho on geographical survey maps), forest trails and spectacular views of the Talamanca Mountains. 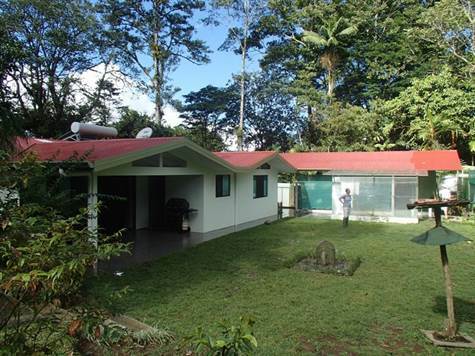 Finca Cántaros is probably the second best known property in Coto Brus, the first being nearby Las Cruces Biological Station/Wilson Botanical Garden, a center of scientific research and intellectual life of the community just 2.5 km away. Finca Cántaros also has archeological interest, centered on its 3000-year old lake and wetlands. Prior to purchase by the current owners in June1994, the original forests of the property had been cleared during the 1960s for coffee plantations, then later converted to cattle pasture. Since then, the property of seven hectares (17.3 acres) has been reforested and restored with thousands of native trees, palms, fruits, and understory plants. -Over 17 acres of gardens and secondary forests with trails -Bird watching (over 200 bird species observed to date); bird list available -3000+ year-old Lake Zoncho wetland with aquatic birds -One of the most studied private sites in Costa Rica forpre-Columbian archeology -Ancient petroglyph and grinding stone on display -Lookout points to San Vito, the Coto Brus valley, and the Talamanca Mountains -Large Rancho with electricity, water, and BBQ grill is ideal for meetings and parties; accommodates groups up to 40 -Three smaller ranchos with picnic tables throughout the property -Camping sites and space for one RV -Small lending library for children and adults -Store featuring crafts of the Coto Brus area, Central America including carvings, textiles, pottery/ceramics, baskets, and masks. FRONT BUILDING - What is now the Cántaros store, library and caretaker-family home was originally a rustic house built in 1962 by Miguel Jimenez, its first resident, for Italian pioneer Vito Sansonetti, the first owner of the property. In 1994 the building was remodeled by raising the roof and adding the library space and porch, but the original wood floor, walls and character of the home were retained. Building is 900 sq ft. Caretaker’s space includes 1 bedroom and 1 bathroom.